Employees that conduct routine maintenance such as watering, spacing and pinching plants in the greenhouse, would be even more valued if they could also recognize a pest infestation cropping up in a hot spot. One early pest treatment or catching a problem before disastrous consequences would more than pay for the training costs. More seasoned employees could also use occasional refresher training. 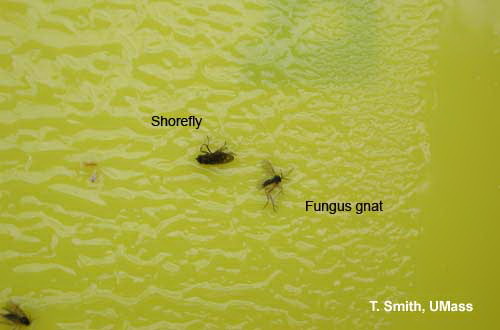 For example, the expanded use of biological control agents in greenhouses has resulted in new insects being found on sticky cards that had not been previously observed as frequently in conventionally grown crops. Learning to recognize the basic pests, their various life cycles and their natural enemies is a valuable skill for all greenhouse employees. Two great PowerPoint slide shows by Leanne Pundt, UConn are available that would be useful to train employees. It includes pictures and descriptions to help identify some common insects and some beneficial insects on sticky cards and tips for scouting pests on poinsettia crops.